Ugh. Rain. And cold. It’s all so blah and gloomy and awful. Your typical melancholy hits and then…? WAIT. ALCOHOL EXISTS. We’re going to be okay. Sometimes the blustery, rainy or freeze-from-the-inside-out kind of weather is a blessing in disguise. If you’re anything like team Oliver + Sons, partaking in a little cold weather imbibing can melt away your sorrows and warm you up faster than a pile of blankets. From quick-and-dirty to just a little on the classy side, we took the liberty of throwing together our favorite adult beverages for any occasion or wintertime mood. Martini: Put all the ingredients in shaker, add ice and shake, shake, shake. 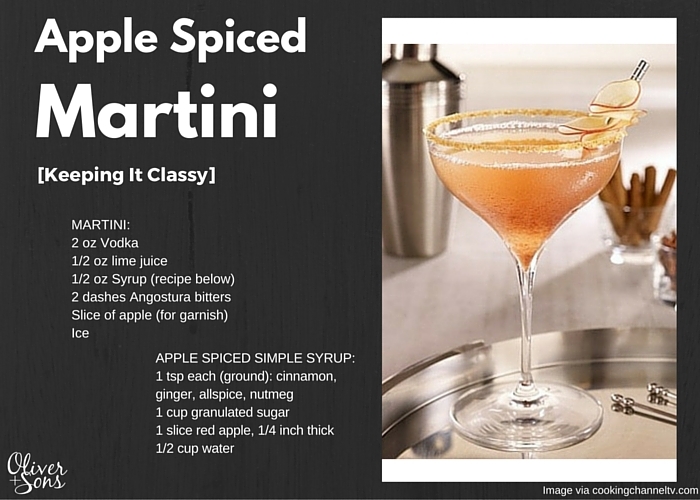 Strain your delicious concoction through the shaker into a chilled glass, then garnish with an apple. Apple Spiced Simple Syrup: Place all the ingredients in small saucepan, and bring to a steady boil. Strain the syrup into an airtight container, cool and refrigerate. This goodness will stay fresh for up to 2 weeks. Why Attiya Loves It: It’s like roaming an orchard, drunk. Mixes that rural feeling of plucking apples off the tree and curling up in the corner of a swanky nightclub. ALL FOR IT! Place the sugar cube into old your glass and saturate with bitters. Add a dash of plain water and “muddle” it up until the sugar is dissolved. Then, fill the glass with ice and add whiskey. Garnish with an orange slice and a cocktail cherry. 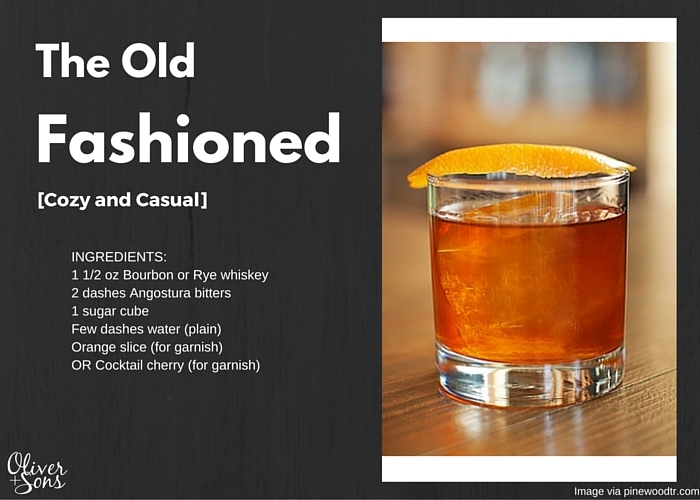 You can serve this bad boy on the rocks or poured over ice. Why Tiffany Loves It: Classic. You really can’t go wrong… well I guess you could if you have more than two, or three. Just pretend you’re Don Draper and deal wit it. 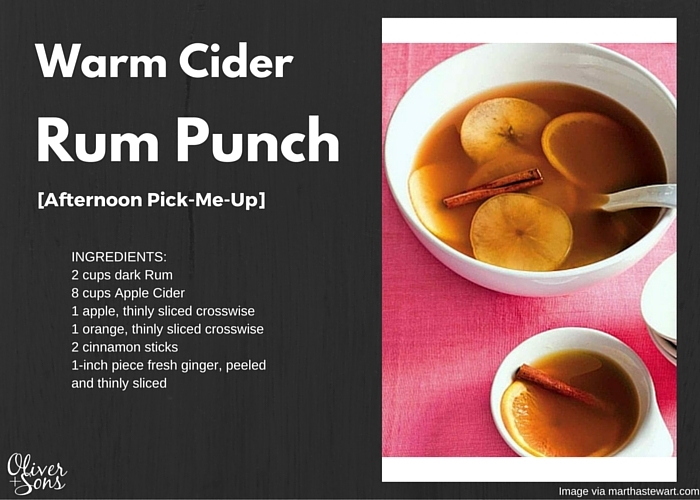 In a large pot, combine the cider, apple slices, orange slices, cinnamon sticks, and ginger. Bring to a boil over high heat, then reduce to a simmer and cook for 5 minutes (you can keep it warm over low heat for up to 2 hours). Remove from the heat and stir in as much rum as your taste buds allow. Transfer to a punch bowl and serve while steamy and warm. Why Ariel Loves It: Mmmmmmm. This is the best for dinner parties. The after-dessert cocktail to wind the evening down and gather everyone around the fire place. Or space heater. In a medium saucepan, combine the milk, sugar, cocoa powder, cinnamon and nutmeg over medium heat until heated through (about 2-3 minutes). 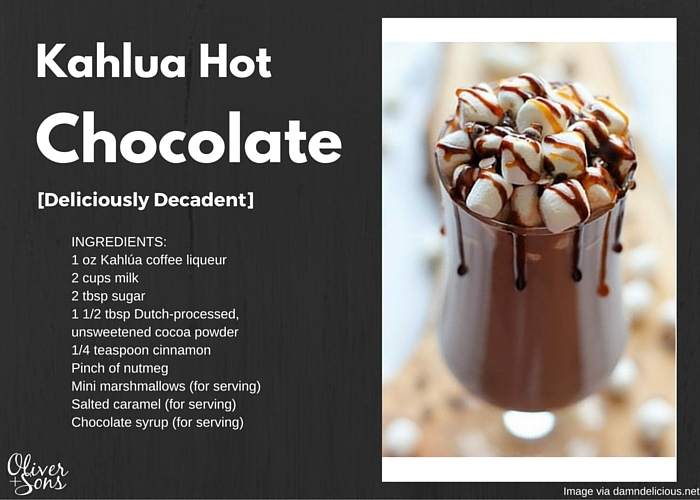 Remove from heat and stir in that creamy Kahlúa. Serve this magic immediately, garnished with mini marshmallows, salted caramel and chocolate syrup. Why Tiffany Loves It: After skiing this winter, I found that anytime you mix chocolate, booze and dairy products, you essentially win at life. It’s the perfect pick-me-up or nighttime-treat for the sweet tooth… Santa would approve. Warm a mug by filling it with boiling water and letting it sit for a few minutes, then pour out the water. Add the honey, lemons, cloves, and cinnamon to the bottom of the mug. Pour in the piping hot Early Grey tea and stir until the honey is fully dissolved, then pour in your choice brandy and amaro. 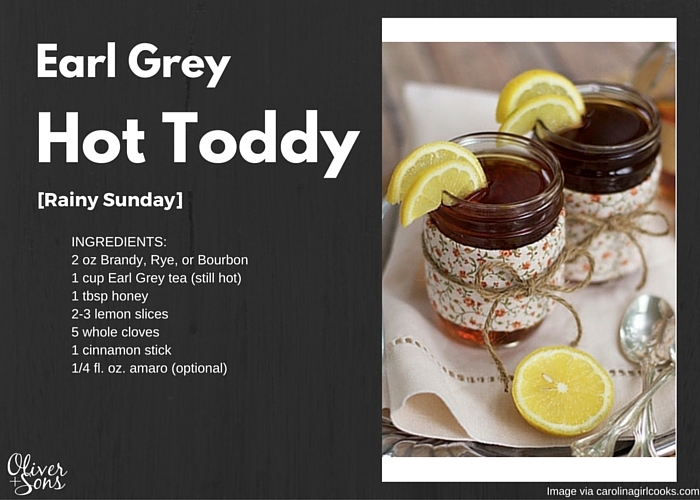 Why Attiya Loves It: This is the luxury Hot Toddy. The herbal-ness really makes you feel like you’re sipping on something healthy. Honestly, I am going to keep making this long after winter ends. What are you favorite cold weather cocktails? We’re always in the mood for more of that sweet, sweet creative inspiration – find our other year-round fave concoctions on our Pinterest Board.